Watsonville, CA – “If you’re not doing something new and exciting, you’re not putting on a great Fair.” The Opening Night Gala lives up to Fair Manager Dave Kegebein’s vision of a great Fair. The Gala is the brainchild of volunteer management team member Jonathan Barr and promises a dazzling evening to kick off the county’s signature late summer event. Guests will enjoy a delicious array of appetizers, wines, fine chocolates and a full no host bar. The tasty delights will be provided by restaurants and caterers including Shadowbrook, Kiss Catering, Marich Fine Chocolates and Handheld Catering. “Bill the Oyster Man,” Bill Callahan from Santa Cruz, will be shucking fresh oysters at his raw oyster bar. The evening will be filled with other special treats promises organizers. 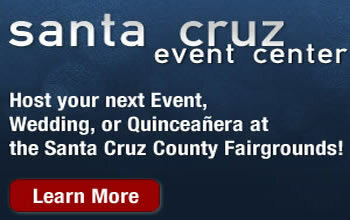 Tickets are available online for $75 by going to SantaCruzCountyFair.com and include valet parking, a private entrance to the Fairgrounds, admission to the Fair and the Gala. Proceeds will benefit local youth groups and the Heritage Foundation.